Blogger.com allows authors and webmasters to easily add Google AdSense ad units to Blogger blog content pages to earn revenue by displaying relevant ads by using AdSense page element (commonly known as widge) in Blogger template. This feature allows many bloggers who are not familiar or not ready to modify HTML code programming to easily join and put up AdSense ad blocks to the web pages and blogs. However, when configuring AdSense page element, after signing in and linked Blogger to user’s Google AdSense account, only AdSense publisher ID (e.g ca-pub-7042087181757148) is captured and placed into the ad code in blog’s template. 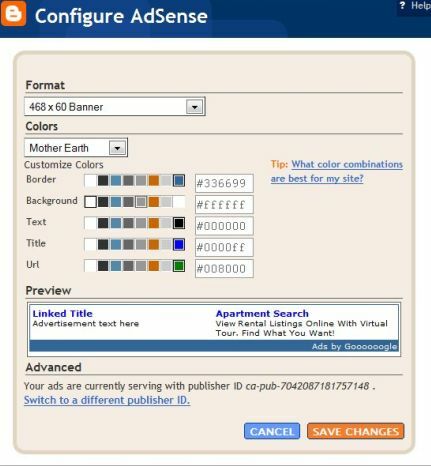 Other settings that can be configured are ad unit format and colors, with no options to set the custom AdSense reporting channel for the ad unit. Custom channel is a feature in AdSense which is used to keep track of ad performance by allowing users to view detailed reporting on performance and revenue statistics of specific pages and/or ad units. Armed with this data, bloggers can then optimize the ad units individually to improve the AdSense performance. Remove any AdSense page elements from the blog’s template. To do so, click on Edit link of AdSense gadget element, and then click on Remove Page Element or Remove button. Login to Google AdSense account, and generate the ad code by using AdSense Setup for Content product. Remember to select up to five custom channels to track the performance of this ad unit. Click and drag to realign and rearrange the new page elements to the position you prefer on your blog. Click on SAVE button on top right corner if needed.